Description: Decorating with Tile explores the many design possibilities of tile. 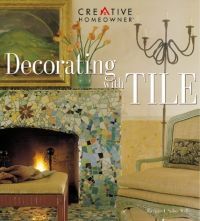 This idea-packed book gives the reader a background in the ancient practical and decorative applications of ceramic tile, and presents myriad types, styles, designs, and makers of this clay art from past through present-day. Besides the many examples of ceramic tile, it offers advice for choosing tile for both interior and exterior decorating projects. Both mass-produced and handmade tile is featured.